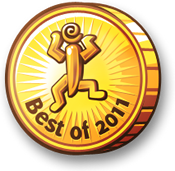 It would appear that The Book of Living Magic has won the Best of Casual Gameplay 2011 award for Best Point-and-Click Adventure! Am I happy? Of course I’m happy, are you mad? Especially since these awards are based on the votes of actual players, not “industry experts” and such. Because the truth is that actual players don’t care about concepts of gameplay innovation and ludological theories: they care whether something amuses or touches or enlightens them. I was repeatedly told that The Book of Living Magic wasn’t something players would want, because it has walls of text and is therefore boring, because it’s too easy, because it’s not whatever is currently fashionable. Alphaland took second place in the Interactive Art or Experimental category, and that too makes me very happy. This is another game that “experts” said would not appeal to anyone, and yet here we are. It doesn’t matter whether it won first place or not, it matters that people liked it, that that journey meant something to them. Maybe we shouldn’t listen to experts so much. I couldn’t have made Alphaland without Terry Cavanagh’s support, and I couldn’t have made it through 2011 without all of you. Here’s hoping 2012 will be twice and productive and half as frustrating.